Sometimes with the busy day to day of family life things like sorting out finances can take a bit of a backseat however by putting together your very own family budget the benefits can be huge and can really help you to keep costs low. Putting a budget into place is really important in the long-term especially when it comes to buying those large purchases such as a family car or a Summer holiday. It is also great for keeping on top of what you are spending so you don’t overspend and see more debts totting up plus budgeting really does help when it comes to saving. It can be really hard to find the discipline to put money aside however saving a small percentage of your monthly income can be really handy for when those emergencies crop up, having a bit put aside means less stress and worry and if you don’t use it, then it is really handy to put towards the Christmas and birthday present fund. Most importantly if you set your budget as a family then it can reduce disagreements over spending and children will learn good money skills which they can then go on to use these in their own lives. Before you can start to think about ways to cut down your family budget then it is important to know what you need to include. For example the following are on most peoples lists- Food, Shelter, Clothing, Education, Utilities, Fun, Medicine/Vets, Savings. So what should a family budget include? First things first, to put a good economic plan into action simplicity is key! Use Excel to keep a monthly spread sheet detailing all the money coming in and all the outgoings you have or a good old fashioned notepad and pencil will do the job just as well. The main objective is to find where your money ‘needs’ to go and where you ‘want’ it to go. Having a goal is also very important, it might be decorating the kid’s bedrooms, buying a new car or even a family holiday, it will really help give you the discipline you need to put money aside. Create fixed and discretionary categories, so your fixed spending is the rent, utilities and groceries and discretionary is meals out, shoes, clothing and gifts, looking back on your discretionary items can really help you when it comes to making important cut backs, so always keep receipts so you can look back each month and decide what you can and can’t do without. Paying off any debt is an absolute must, if you find you are struggling with finances then setting up a budget can really help set realistic targets and help you get back on track. Always pay on time and if you can, by paying off a bit more each month you will see the total disappear a lot quicker. If you find you are getting large bills too close together you can always change your billing cycle, most creditors are happy to adjust it for you if you ask. One good idea to help you keep on track with your finances each month is to set a buffer, so take the highest figure you have ever paid for a utility bill and use that as your figure to meet each month, that way should you have any surprises you’ll be covered however if the bill comes in lower you have a bit of spare cash to play around with. Once you get into the swing of things and you are using your budget more and more you will find that maintaining your family budget is easy! Once you have been keeping to it for a month or two then it might be time to look at ways of cutting back, make sure you are not paying for anything that you are not using, cut back on meals out and enjoy more family meals in, most importantly of all don’t spend what you don’t have, saving up for a treat is more rewarding in the long run rather than splashing out and regretting spending the money you don’t have. Meal planning– planning your meals for the whole week can really help when it comes to cutting costs on your food bill. By having an idea of what to cook on what day you can really streamline your shopping lists and resist the urge to chuck anything and everything into your trolley. Sit down as a family at the start of each week and make a list of meals and packed lunches for the week ahead, then stick to the plan. Cook with in season food– fresh produce is always a good choice as it is super healthy for the family and at different times of the year there are some amazing foods in season that you probably would never have tried before, the best bit? It is always a lot cheaper and readily available! For example use a range of veg to make tasty, filling soups in the colder months that can be reheated as and when you need them and when it gets warmer make more delicious salads using Summer salad produce. Use cheaper cuts of meat– there are so many different cuts of meat out there and with so many of them being not only good for you and family but also coming in cheaper, now’s the time to embrace them! Cooking on a budget doesn’t mean you have to cut meat out of your diet but choosing different cuts will really help you save some pennies. For example, choose chicken thighs over chicken breasts, they are packed full of flavour, meaty and an absolute bargain or why not buy a whole chicken and portion it off yourself, freezing the parts you don’t use. Don’t forget to use the chicken bones to make a tasty stock you can use at a later date. Use a slow cooker- using a slow cooker or a huge casserole dish is perfect for chucking together lots of left over vegetables and meat to make a scrumptious hearty dinner that can be re-heated for lunch the next day! Doing all the prep the night before then leaving it to cook while you get on with your day saves you a lot of time and money! Using this way of cooking can really transform those different cuts of meat, making them soft and more tender, it’s also a great way to cook up all those left overs too, remember you don’t want any waste! Freeze Food– stock up on meat and vegetables as these can easily be frozen until you want to use them. Making small meals in batches then freezing them not only saves you time but it also works out more cost effective. This is a really simple way of getting more for your money, just be sure to make a list of what is in the freezer and eat it according to the dates to ensure it doesn’t get left at the back and forgotten about. Another good idea is to buy already frozen foods such as veg; these are massively overlooked and can be just as good for you, choose ones with no added sugar or salt to really get the benefits. Eat Healthy-swapping expensive junk food for a healthy alternative is often not only beneficial to your health but also to your wallet! Adding more rice, pasta and beans into your cooking is a great idea as these can picked up very cheaply and are extremely filling which means small portions! Use the local greengrocers to get more fruit and veg for your money and instead of buying sweet treats, make your own! Ingredients can be picked up for a few pounds and you can make a huge batch to store. Don’t forget to get the kids involved, if they can see that making your own tasty food from scratch is so easy they are more likely to put it into practice themselves. Shop Around– lastly shop around for your food, you don’t have to stay loyal to one supermarket. You will often find that budget supermarkets such as Aldi or Lidl have a fantastic range of fresh produce for great low prices that will save you a bundle. Why not pop to your local market or greengrocers, loose fruit and veg normally works out a lot cheaper than pre-packaged. Plus visiting your local butchers is a great for picking up those different cuts, if you’re unsure what to choose they are happy to offer helpful advice. By being a bit more savvy when it comes to food shopping you will soon get into the habit of looking for a bargain and in the long run you can save more! If you’re a new mum or mum to a new baby then you will know that baby clothes can be quite expensive. Ask family members if they have second hand clothes you can use as babies grow so quickly that spending a huge amount on clothes can feel like a bit of a waste. Shop around for multi packs of baby grows and vests, buy these essentials in bulk rather than little outfits as they will spend a lot of time in them plus they are super cheap. For babies, always buy gender neutral colours as these can be used again and again, for example white, yellow and green are versatile colours girls and boys can wear. Anything you don’t use again can be sold on eBay or given to charity shops and family members to use again. For older children, it can be hard to stick to a budget as they grow so quickly, they also chop and change their mind about what they do and don’t like, while playing at school can bring a lot of wear and tear to their clothing and shoes. Try and set two different budgets, one for the warmer months and one for the colder months so it is broken down into two manageable parts, get the kids involved by telling them their budget and helping them stick to it when it comes to choosing their outfits. Make sure you choose clothes that will last and that they can wear at any time throughout the year. Always Spring clean their wardrobe before adding any new items to it, sort out what they do and don’t wear. Hand me downs can be a real life saver if you don’t have much of a budget (most little one’s like to look like their older brothers and sisters after all!) and they can really help save on pennies. Kids clothing is generally better made and really lasts so check out places such as eBay to find quality second hand clothes, you can also pick up some brand new clothing for a fraction of the price on here too. Look for items that say NWT which means ‘new with tags’ while NWOT means ‘new without tags’. While we don’t want our kids clothing to be too big on them, there are a few pieces than you can afford to go a size up, meaning they will last longer. Coats, jumpers and PJ’s are items that can always be worn a bit bigger to keep them warm. Don’t buy baby shoes- until your baby learns to walk properly there really is no point in buying shoes as they will only pull them off, try and eat them or not like having something on their feet. Babies are happy enough learning to walk in socks or by being bare foot. Once they do start to walk, take them to get their feet measured so that their shoes are well fitting and will be comfy for them to wear. Buy for the future- sales are your best friend when it comes to buying shoes for the kids, buying larger sizes now for when they’re that bit older could save you a small fortune in the long run. If you come across a style that both you and they really love, buy a couple of pairs so you always have a spare should anything happen plus by adding a couple of pairs in a larger size of the same style will also help as their feet grow. Measure their feet- you want their feet to be as comfy as possible in the best fitting shoes so be sure to get the correct size for their feet. Here at Shoe Zone we have foot measures in all stores so be sure to take advantage of that. Do take into account the time of year, for example, in Summer their feet will swell due to the heat and in Winter they will need extra room in shoes and boots for cosy socks. Trying shoes on, especially for kids is the key, so always shop for their shoes in store unless you are 100% certain of their size. Look after Shoes– looking after the shoes they already have is very important for long lasting use. Use shoe polish and a brush to keep them looking shiny and smart and use a water resistant spray to help keep shoes dry during wet weather. If the laces are looking a bit tired simply update them with a new pair. Find our range of bargain shoe care here. Stick to a couple of pairs– always remember that they can only wear one pair of shoes at a time! Choose a pair of shoes they can wear for school and play which will go with any outfit. It is not ideal to only have one pair as they do tend to wear down faster however sometimes you will find you can only afford the one pair at a time. If you are looking for more than one pair always go for one pair of black shoes, trainers, sandals and boots, that way you will have all weather and occasions covered! Be sure to check out our fantastic range of affordable kids shoes here. 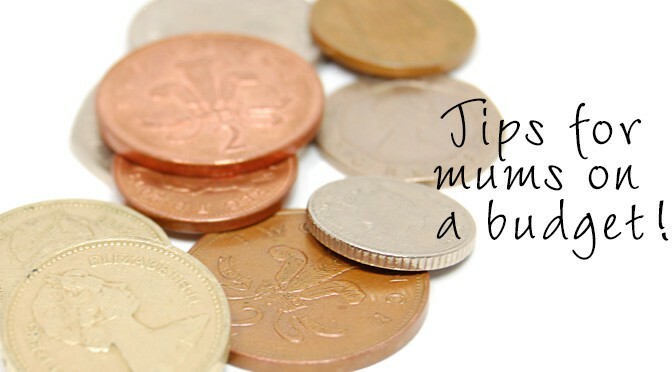 So there you have it, our top tips for you mums out there on a budget. It really is so easy to set up that family budget and once you get started you will really reap the rewards. Why not put into practice some of our ideas on how to set up your budget, to ways of saving money on food, clothing and most importantly shoes. Be sure to check out Shoe Zone’s range of quality kid’s footwear and see how much you can save, with those spare pennies you can put them towards that family holiday! Thank you for your comments. Our Customer Services Team are on the case for you. Should you need anything else you can get in touch with them via email customerservices@shoezone.com or by calling 0116 222 3113.